The most effective router and switch simulator for hands-on CCENT skills enhancement. CCENT 640-822 Network Simulator, Second Editionhelps you develop and improve hands-on configuration and troubleshooting skills without the investment in expensive lab hardware. This state-of-the-art, interactive simulation software enables you to practice your networking skills with 130 structured labs designed to help you learn by doing, which is the most effective method of learning. The labs are divided into four different types: skill builder labs which help you practice short, focused configuration tasks, complex configuration scenarios, which present realistic multi-layered configuration tasks, challenging troubleshooting scenarios, which provide you with an opportunity to test your problem identification and resolution skills, and subnetting exercises, which help you improve the speed and accuracy of your subnetting calculations. Experience realistic network device response as you work through each of the labs, which include detailed instructions, topology diagrams, hints, and full solutions. Unlike other simulators on the market, the lab scenarios included in the CCENT 640-822 Network Simulator, Second Editionare far more complex, challenging you to learn how to perform realistic network configuration and troubleshooting tasks. 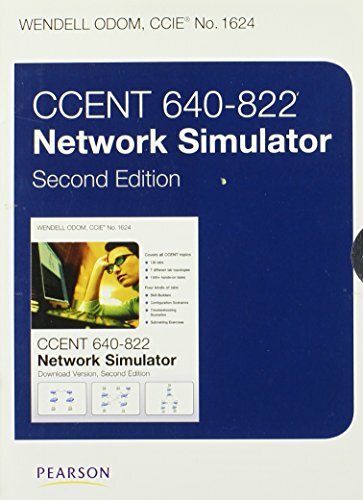 CCENT 640-822 Network Simulator is available only as a download, and is a subset of the CCNA 640-802 Network Simulator, covering all the ICND1 topics. This Second Edition includes 32 new subnetting exercise labs. Wendell Odom, CCIE No. 1624, splits time between writing Cisco Press books and teaching Cisco authorized training for Skyline Advanced Technology Services (http: //www.skylineats.com). Wendell has worked in the networking arena for more than 25 years, with jobs in preand post-sales technical consulting, teaching, and course development. He is the author of all prior editions of the Cisco Press "CCNA Exam Certification Guides," most recently the two-book set "CCENT/CCNA ICND1 Official Exam Certification Guide"and "CCNA ICND2 Official Exam Certification Guide," Wendell has also authored several other titles, including the "CCIE Routing/Switching Written Exam Certification Guide," "QoS Exam Certification Guide," and "Computer Networking First-Step," all from Cisco Press.